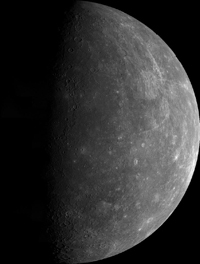 On February 1, 2008, MESSENGER performed its first flyby of the planet Mercury. Final orbital insertion is scheduled for March 18, 2011 but another flyby will occur before then - on October 6, 2008. Scroll to the bottom to learn more. With limited visits by space probes, we know very little of the planet Mercury. Mercury does resemble a familiar body - the Moon - but is larger and more dense than the Moon. 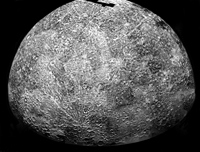 The density of Mercury is actually 60% more dense than the Moon, which indicates a larger iron core. The evolution is similar to that of the Moon in that differentiation occurred (iron at the center), extensive cratering is present, and basin flooding like the maria on the Moon is present. 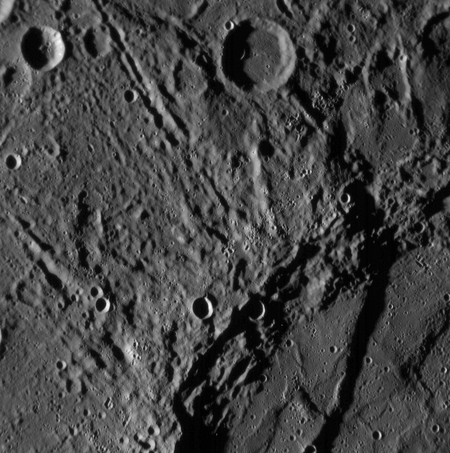 One feature that is present on Mercury and not the Moon is the presence of what looks like small fractures scattered over the surface. The second image below shows these areas. It is thought that this is a result of a rapidly cooling of the planet early on resulting in some shrinkage. For eclipse information, visit the eclipse page. What is surprising is that Mercury does have a trace atmosphere. Mostly helium, this atmosphere is easily escaped into space and does not assist in controlling the temperature (in fact its so minor its almost not worth mentioning). Because of the lack of a substantial atmosphere, the solar radiation heats the Sun side of the planet to intense levels while the dark side can reach to well below freezing. 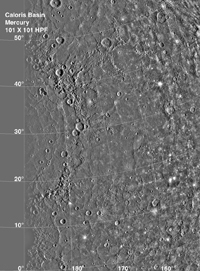 Of all the feature on Mercury, the most prominent is the Caloris Basin, seen in the last image above. This is actually an ancient impact crater that spans 1300 km in diameter - one of the largest in the Solar System. material from the impact extends an additional 600 to 800 km. The MESSENGER mission has set out to change what we know about this small, rocky planet. The first flyby of this probe already revealed a previously unseen side of Mercury - already the probe is performing as promised. This unseen side shows just how dramatic the surface has evolved. In fact, the MESSENGER probe is designed to teach us more about how terrestrial planets (planets without large, gaseous atmospheres) evolved. Why is Mercury so dense? The core is metal-rich and contributes to 60% of the planet's total mass. What is the geologic history? 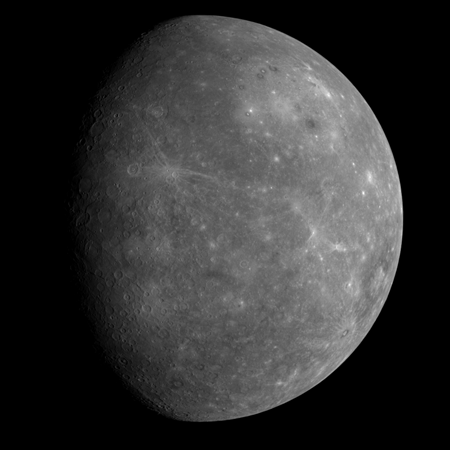 Only 45% of Mercury has been imaged. MESSENGER will image the entire planet. What is the nature of Mercury's magnetic field? Like Earth and Mars, Mercury has a global magnetic field. Venus does not. What is the structure of Mercury's core? It's density along with gravitational field measurements will help determine this. What are the unusual materials at Mercury's poles? Radar images from Earth speculate that ice may be present within some of the crater walls not exposed to the Sun. What volatiles are important at Mercury? 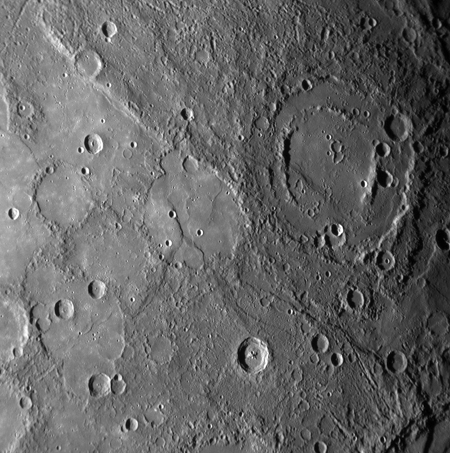 The composition of Mercury's thin crust will be determined. These answers will help us better understand terrestrial planetary formation. One thing we have learned with the current data and that is Mercury is shrinking! The cause is simple, the iron core is continuing to cool. The result of the cooling are the cracks we see on the surface.